Our paints range includes all traditional techniques such as oil, acrylic, watercolour, tempera and gouache as well as more contempory practises such as mixed media effect paints, and spray paint. We also offer a recommended selection of schools. Liquitex Professional Heavy Body Acrylic Paints are made using only the best and most fade-resistant pigments, making this an artists' acrylic of the highest quality. These paints have a buttery consistency and smoothness that resembles oil paint. I should say that I’m fussy about watercolours, well about all materials actually…but watercolours can be incredibly disappointing and frustrating if they don’t deliver a really good pigment load. These are terrific, and offer great quality pigments, and good value too. The colours are notably intense, and they handle well too, both with very little dilution and also when made into really wet washes. What are the differences betwen acrylics paints: heavy, soft or fluid? It is not always easy to find what you want among all these brands of acrylic paint. Generally when an artist seeks acrylic paint, he wants a particular colour, but also a perfect viscosity. Heavy Body, Soft Body, Fluid Body, several types of acrylic paint exist on the market but there is no standard type, so the specifics noted on tubes or pots can make the choice easier. Consider your palette, your paint set, your box of pastels. We appreciate colour, but possibly it is so readily available that we don’t often consider how it came to be in our hand. From raw pigments to a perfectly manufactured tube of colour. Our paints range includes all traditional techniques such as oil, acrylic, watercolour, tempera and gouache as well as more contempory practises such as mixed media effect paints, and spray paint. We also offer a recommended selection of schools. As well as the pure colours, you can also explore the range of mediums and accessories developed for each painting medium to help you achieve a multitude of effects, such as liquin for oil painting, or masking fluids for watercolour. 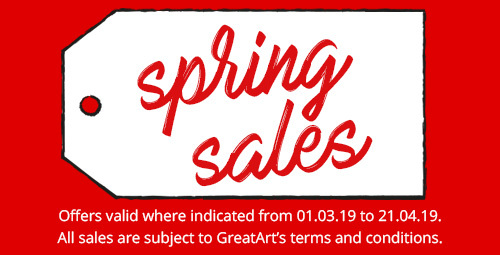 Find all your favourite brands including Daler Rowney, Winsor & Newton, Golden, Molotow, Daniel Smith, System 3, Pebeo, and Michael Harding.